At the 2012 TSMC Tech Symp in April they revealed Reference Flow 12 which shows 2.5/3D firmly entrenched in the TSMC roadmap. 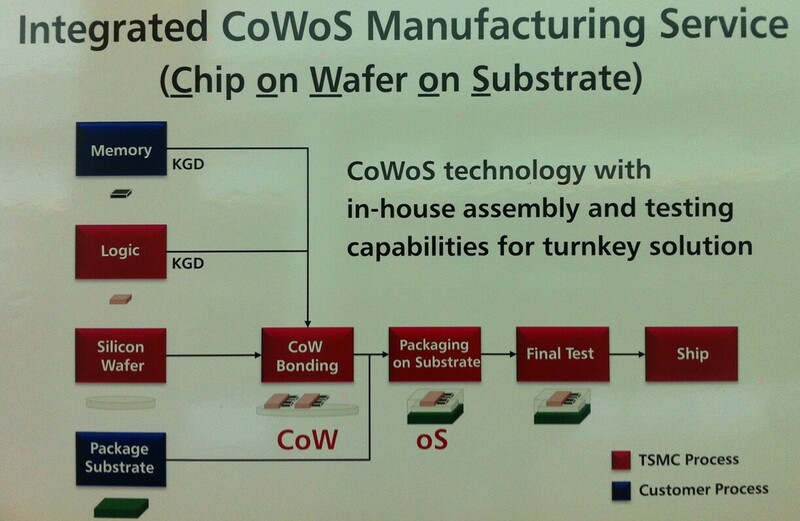 Indeed TSMC isnow showing slides where only the memory and substrates are coming from external sources, making them a turnkey solution for what they are now calling 3.5D [link]. In IFTLE 88 “Apple 2.5D Rumors; Betting the ranchâ? ?¦” we drew an analogy of putting new fab production in place to a poker game in the Wild West – or betting the ranch. Well, the recent announcement by UMC certainly had them tossing their chips into the center of the table matching the recent capacity announcements by TSMC and Global Foundries. The UMC 300mm Fab 12A Phase 5 & 6 in Tainan will extend 28nm production. 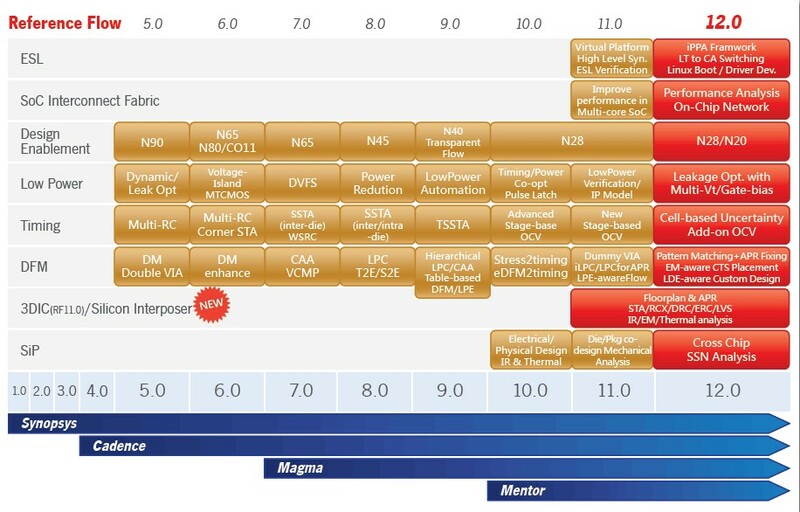 P5 & P6 will provide advanced 28nm, 20nm, and 14nm capacity, and is scheduled for equipment move-in during the second half of 2013. Total cleanroom area is 53,000m2 and will be capable of 50K wafers per month, bringing total monthly design capacity for Fab 12A to 130K wafers. With the planned P7 & P8, the eight phase fab complex will have a total design capacity of 180K wafers per month. Cumulative capex for UMC’s Fab 12A phases 1-4 is projected at $ 8 billion, with P5 & P6 to add nearly $ 8 billion more. There are further plans for P7 & P8. As we said earlier, only the big time players are sitting at this table. With such investments, UMC is certainly showing that they intend to stay in the game. The IEEE ECTC meeting was last week and for those of you who are unaware, it is the number one show for advanced packaging in the industry. 2.5/3D has grown steadily at this conference and it now appears to be nearing 50 % of the ECTC content [ 50% of 6 parallel sessions for 2.5 days] . There were no major announcements at the meeting, but there were some interesting rumors. My filtering criteria is that I must hear the rumor at least twice from separate sources before I report it on to you. None of these could be substantiated by the parties involved, but that is not surprising. IFTLE has reported before that rumors were swirling that a future generation of the IBM power chip processor would be using a 2.5D interposer configuration. Very strong, multisourced rumors at ECTC persist that the Power8 is currently undergoing testing in IBM servers and we could be hearing about this major interposer announcement “soon” . If your like me, you have been waiting for 5+ years for the imminent 3D announcement from Intel. Recall that we have been told that the technology is ready but it would be up to the product departments as to when to introduce it. Well, not so good news here. The rumor going around is that we are probably looking at 2017 when 450 is introduced. (Don’t shoot me I’m just reporting the rumor. ) If anyone from Intel would like to deny this and give IFTLE better information please send me an email. Back in IFTLE 88, “Apple 2.5D rumorsâ??¦â? ?¦” (which I’m told was the most read IFTLE blog of all time) we discussed the fact that TSMC and Samsung are in competition for the next generation , the A6, processor for the Apple iPod, iPad etc.. Although everything is hush, hush, it is clear that TSMC is at least developing prototypes based on their interposer technology. It is unknown whether Samsung is doing the same (but we can hope so). Two opposing rumors were making the rounds at ECTC. Rumor 1 had Samsung about to make a 2.5/3D announcement, but rumor 2 had Samsung developing an “unknown technology” that negated the need for TSV and leading them to the conclusion that 2.5/3D would not be needed in the future. The Samsung clamp down on the release on any information on 2.5/3D remains â??¦hermetic . Yes these could in fact be the same rumor, but I, for one, hope not. Lots more from the ECTC over the next few weeksâ??¦â??¦â??¦â??¦â??¦.. For all the latest on 3DIC and advanced packaging stay linked to IFTLEâ??¦â??¦â??¦â??¦â??¦â??¦â??¦â??¦â??¦â??¦â??¦â??¦â??¦â??¦â? ?¦.